The best advice for boating when the waters are in flood stage is: “Don’t.” That’s good advice, but not always taken and perhaps not easy to follow. Okay, we’ve got a definition…and it’s subjective…and let’s start over. 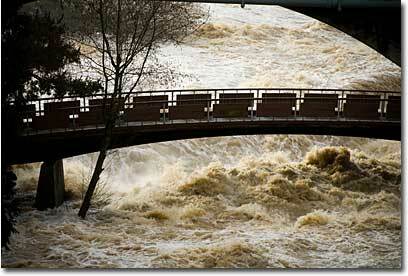 Whether a river, creek or other body of water is technically at ‘flood stage’, even if it’s abnormally high – Beware. The information below is gleaned from the hard-won, often negative experiences of NRS boaters and others. We’re passing it along in the hope that those who read it will avoid learning the hard way. Several of us have lost friends and acquaintances in boating accidents. We want you to be safe. Debris in the water. The rising water pulls streamside debris into the flow. Banks get undercut and trees, fence posts and structures fall into the water. You can find yourself sharing the run with all sorts of foreign objects. Strainers. Trees and logs get lodged and create severe hazards. Water flows through and around them; you and your boat won’t. In larger streams you may be able to avoid them. In a smaller stream, a strainer can completely block it. Undercut rocks and boulder sieves are also severe entrapment hazards that can be created or accentuated by high water. Low head dams. 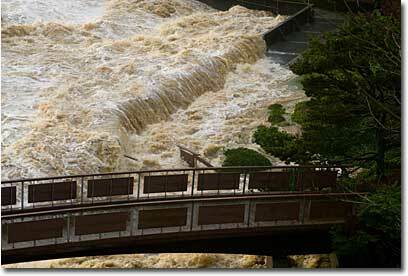 A low head or “run of the river” dam is used to raise the level of a stream. Water flows over the lip of the dam and creates a perfect reversal on the downstream side that can go from difficult to impossible to get out of. They are dangerous at any flow, but can be particularly strong at high flows. Bridge abutments. They can catch debris and even block off the channel. Even without debris catch, they kick off big swirling side-curling waves. Turbid water. The muddy flow hides hazards that would normally be visible. Water out of its banks. The stream can flow out into the surrounding countryside, taking you into trees, brush, fences and other entrapment obstacles. Cold water. Especially in the spring, cold water significantly increases the risk of hypothermia. Fast current. Normally, the higher the water, the faster it is flowing. Things happen fast, you have much less time to react to conditions. Entrapment. Strainers, undercuts, debris, etc can catch and hold a boater and their boat. If you ever find yourself out of your boat, being pushed into a strainer that you can’t avoid, your best chance of survival is to swim aggressively toward the obstacle and attempt to pull yourself on top of it. If you get swept under the strainer, you’re likely to be held underwater and drowned. Foot entrapment is a more serious hazard in swiftly moving water. A foot wedged in a rock crevice or under other underwater debris will cause your body to be forced and held under water by the current. Never put your feet down unless the water is quite calm or quite shallow. Flush drowning. Sometimes boaters that end up swimming in high water accidents are found dead, even though they are wearing PFDs and appropriate safety gear and apparel. The abnormally fast moving water can create a scenario with no eddies and no chance to self rescue. The swimmer gets tumbled and re-circulated continuously. Drowning does certainly occur in these circumstances. Also, some victims are found with no water in their lungs. In these cases, it’s assumed they are victims of the phenomenon of laryngospasm or dry drowning; where a splash of cold water in the throat, or some preexisting medical condition causes the larynx, or wind pipe, to shut, preventing the person from breathing. Being knocked unconscious. This is always a possible boating accident consequence, but is even more of a risk in high water. Things happen fast and floating and lodged debris is a real hazard. Wearing a helmet is highly recommended. As we said earlier, the safest choice when waters are flooding is to stay home. However, we know it’s tempting and can be exciting. Also, some streams are small enough or have such a limited watershed that they can only be boated after a rain event or during snow melt. Scout such streams ahead of time; look for obstacles, landmarks and portage points. Boat with team members who are experienced and equipped to deal with the unexpected and emergency situations. So here are some suggestions for making it as safe as possible if you make the attempt. Don’t boat alone. That’s good advice anytime. But also remember, the support of the group is good, but you are ultimately responsible for your own safety. Just as you should always ‘dress for the swim,’ use that mindset in the decision process of whether to boat in a stretch of water. If you look at it and say to yourself, “I wouldn’t swim in that.” – don’t go boating in it. It goes without saying, but we’ll say it anyway – always wear a good fitting, appropriate life jacket. As we said earlier, a helmet is highly recommended. The right protective clothing is vital, especially in cold water. Read Cold Water Gear and Layering for Cold Water Boating for help in picking the right gear. Bill McGinnis, in High Water Safety Guidelines, gives some excellent advice. It’s aimed at rafters, but much of it is also applicable to other boaters. David Luinstra shared a great piece with us, that he calls The Fine Nine. He’s speaking to kayakers, but again, much of it is good advice for any boater. Things like what he calls “The Knows” are especially important, be sure to read them. Having extra food and water along is important if you get stranded. It’s a good idea to have tools for starting a fire if needed. Some dry clothing and something like the SOL Escape Bivvy Sac can be a life-saver. Consider carrying some items like energy bars and a butane lighter (or other fire making devices) on your person, should you get separated from your boat. Don’t forget medical supplies and please take first aid and CPR training. Bring extras of any kind of gear that is essential to safety and the success of the trip, like spare paddles or oars. A Kayak Un-Pin Kit or more raft-appropriate Z-Drag Kit is important safety gear to have along in extreme boating conditions. Swiftwater rescue training is good for anyone boating whitewater, but especially applicable for boaters in extreme conditions. There’s some advice about where to find training and other excellent advice in the Safety and Rescue Discussion Group article. Always let someone know where you’re going and when you plan to be back. If you do have an emergency and are overdue, there is someone to alert and guide rescue personnel. Consider carrying some device for contacting emergency personnel. Cell phone coverage is becoming more and more universal. In some areas a VHF or UHF radio may be appropriate. Satellite phones and personal locator beacons are excellent safety devices. Boating in high, flood stage waters is dangerous. If you make the decision to do it, prepare yourself to best survive the experience. Remember, Coming Back is Mandatory. As always, here at the e-News we welcome your feedback and comments. Pass them along by emailing editor@nrs.com. "Ice ledges are the most dangerous feature ever encountered in paddling. An ice ledge, or shelf, is any ice protruding from the bank and on the top of the water. If one gets sucked under an ice ledge, even with an almost imperceptible current, there is no possibility of getting out and of course no air. "Imagine trying to claw yourself along a smooth wet slippery ice surface while underneath it in cold water and most likely not knowing which way to go while the water may or may not be pushing you in the wrong way. Moreover, you were already out of breath when you went under. And no one is able (and probably not willing) to risk their life retrieving you. "Oh, yes. You grabbed the edge of the ice as you were being sucked under and that thin slippery edge didn't break off as you went under. Have I got the image burned in your mind? Quite frankly it sends shivers up MY spine. "OK, of course you can stay away from those and be perfectly safe, right? There isn't really any current, right? And you're a competent paddler who is always under control, right? And you've never dropped a paddle while paddling with gloves, right? And never tipped over trying to grab it. And of course you have a 100% bullet-proof hand roll, right? "And you're wearing an exposure suit so that you aren't incapacitated in about 30 seconds in this water, right? And you never have to take out in some place other than where you planned? And you can walk on slanted or thin ice without ever slipping? And you carry some sort of ice gripper to pull yourself out onto the ice. And of course you're paddling with others who might try to rescue you if something does go wrong, right? "And even if all of these were true, I still wouldn't risk it. The minor pleasure is not worth the tremendous risk. Go skiing instead. A number of fatalities involve foolish paddling when ice ledges exist. Although I can find no specific Coast Guard statistics pointing to ice shelves, the most recent USCG statistics indicate that most paddling deaths involve cold water in the shoulder seasons when fewer people are paddling. "We'll never run a trip when the danger of ice ledges exists. I'll paddle with small broken pieces of ice in the river, but not with ice ledges. I hope this dissuades you from paddling in these very dangerous conditions." Editor's Note: Thank you, Cameron, for that very persuasive warning about the danger of ice ledges. We get so many good comments from boaters who read the e-News. If you have something to say, drop us a line at editor@nrs.com.